« Save A Spaniel – recommended book! After the tragedy of the Haiti earthquake we are all looking for ways to help the disaster response. Please consider making a donation to the nonprofit Search Dog Foundation in Ojai, California, who deployed teams immediately at the request of the US government. You can follow their work in Haiti on the Foundation web site. Did you know that these highly trained disaster response dogs were rescued from abuse and abandonment situations? SDF recruits dogs from across the country that are rescued from abuse and abandonment situations. It costs SDF $10,000 to care for and train each dog, partner it with a firefighter, and provide ongoing training to the team. 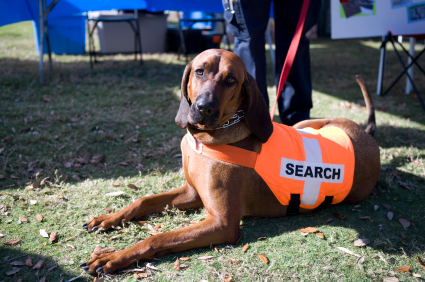 The dogs are provided at no cost to fire departments and disaster response agencies. SDF receives no government funding for its life-saving mission. Please consider supporting their work. This entry was posted on Thursday, January 14th, 2010 at 8:51 am	and is filed under Favorite Animal Nonprofits, Uncategorized. You can follow any responses to this entry through the RSS 2.0 feed. Both comments and pings are currently closed.